Before I became a Momma, I was a product whore. Now that I am kid friendly, I still am, but we'll call it a product monster. I am a product monster. As we all know, the trouble with dishing out on products, is that it costs a lot to find those wow products that you truly love & need, and are happy to pay for each time they run out. That is the shining moment in a product monster's habit - when the golden product is found - the one that makes your life easier. The one you recommend to family and friends, and sometimes complete strangers if you see them hovering close to said product in the store unable to decide. The one that smells so good. Another part of my monster instinct is packaging. I am attracted to pretty shiny things. I have found some of the best products this way. Dr. Bronner's - you know with all the zany writing all over the bottle? I bought that before I even knew what was inside, so many years ago, as a teen in a hippie shop - because of the packaging. I have used it ever since and will forever. I've also found some of the best books that way. While I would never judge a book by it's cover, I wouldn't discount the pretty ones either! Bluum does that for you too. The presentation is perfect. The Bluum box arrives to you in a Bluum postal box. Inside is the actual box which is a nice quality box - ready for gift giving. The logo is nicely printed on the lid. Inside, nestled in pretty tissue paper are that month's selections - some of the best products, from the most posh brands for Mom & Baby. So we've got pretty packaging wrapped in pretty packaging, wrapped in pretty packaging, wrapped in pretty packaging! Yay! My product monster-ish-ness lead me to what I do here at Wishing Penny. It was through starting this web site, that I learned that I love marketing, which might naturally go along with being a product monster. So in trying the Bluum service, I realized, that not only is this service fabulous for mom's who love finding great products, but Bluum is a wonderful service for the brands who are included in their boxes. Participating brands have the opportunity to reach so many mom's who might not have ever heard of ,or not stopped to try them before Bluum. It's a win win situation packed up in a pretty box - the Bluum box. And, take my word for it, this is a PERFECT gift for a new mother. You could give a Bluum membership as a shower gift for just $9 a month - for one year, that's only $108. Or you could gift the starter plan at $11 a month for three months making it only $33. Or, you could carry in one Bluum box for only $12. It's like receiving a little Christmas in a box each month! Like I promised last month, I now have a Bluum box to give away to one lucky reader! *Follow me @jamaise at Twitter & Tweet this : RT @jamaise #GIVEAWAY #WIN Bluum ~ Deluxe samples for Mom & Baby ~ Bluum Box ~http://bit.ly/oUvj8y ~Ends 9/24 tweet each day for one entry each ! I entered the Embroidery Floss Friendship Bracelets giveaway. I am a follower of your blog, and I would love to see something from the baby Arbonne line featured! 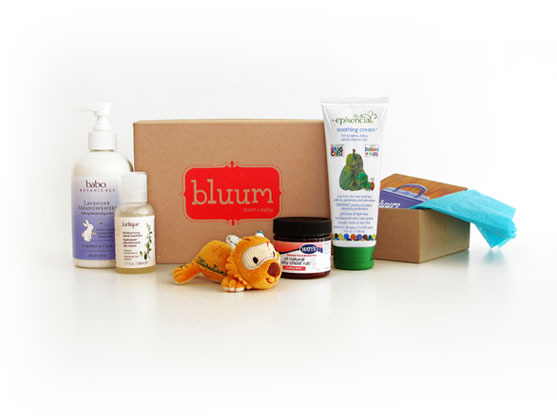 I would love to see organic or natural products in a Bluum box, like cloth diapers or mama cloth. Stuff that most people wouldn't purchase for themselves, whether because they don't know about those products or just because they're skeptical. 1. I like Bluum on facebook. 2. I like Bluum on facebook. 1. I follow BluumBaby on twitter. 2. I follow BluumBaby on twitter. 3. I follow you through GFC. I entered the EmbroideryFloss giveaway. I would like to see some infant/toddler snacks featured, or some different formula samples. I'd love to see CJ's BUTTer featured in a Bluum box. #1 - I Like/Fan Bluum at Facebook as Vanessa Carvalho Coker. #2 - I Like/Fan Bluum at Facebook as Vanessa Carvalho Coker. #1 - Friended Wishing Penny on Facebook. #2 - Friended Wishing Penny on Facebook. #1 - I grabbed your button. Located in right side bar. #2 - I grabbed your button. Located in right side bar. #1 - I follow via Networked Blogs as Vanessa Carvalho Coker. #2 - I follow via Networked Blogs as Vanessa Carvalho Coker. #1 - I follow via GFC. #2 - I follow via GFC. #3 - I follow via GFC. I follow you via GFC. I would love to see the 100% Pure brand offered if it isn't already! Sweetsation Therapy is another great brand that would go well!